Discover high coverage with the PUPA Cover Stick Concealer; an ultra-easy concealer stick that covers imperfections and eliminates signs of fatigue. 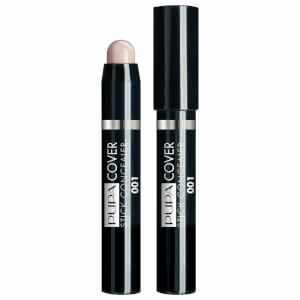 Boasting a comfortable, creamy texture, the retractable cover stick glides over blemishes and dark circles for a smooth, high coverage finish. Spherical Polymers ensure an even application, whilst antioxidant-rich Vitamin E offers moisturising benefits to prevent the skin from drying out. The product blends onto the face seamlessly and creates natural-looking results that makes skin appear flawless. Apply concealer on blemishes, dark circles, lip contour and sides of nose. Use your fingers to blend it gently and, for greater coverage, dab it with your fingertips on critical areas. For a flawless application, use the Foundation Brush of Pupa’s Professional Brush line of products.